SimuLTE models the data plane of the LTE/LTE-A Radio Access Network and Evolved Packet Core. It allows you to simulate LTE/LTE-A in Frequency Division Duplexing (FDD) mode, with etherogeneous eNBs (macro, micro, pico etc. ), using both anisotropic and omnidirectional antennas. ENBs can be connected via X2 interface, and can communicate using both standard and user defined messages. 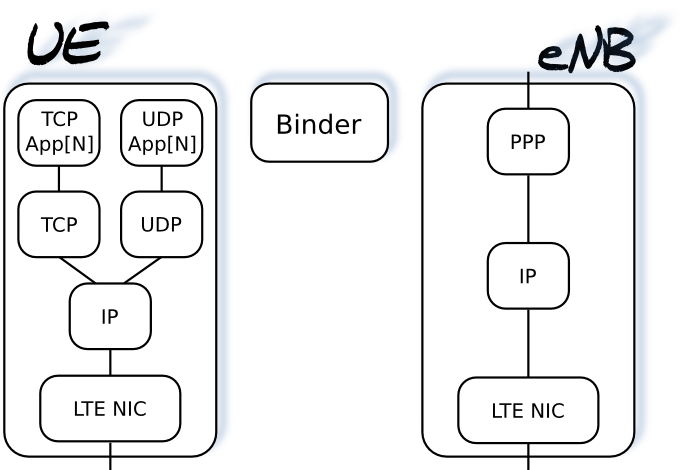 A detailed description of SimuLTE is available in the paper "Simulating LTE/LTE-Advanced Networks with SimuLTE". The implementation and modeling details of the X2 interface are given in "Modeling X2 backhauling for LTE-Advanced and assessing its effect on CoMP Coordinated Scheduling". A detailed description of D2D-unicast operations and implementation into SimuLTE is given in "Modeling unicast device-to-device communications with SimuLTE". The Binder module is instead visible by every other node in the system and stores information about them, such as references to nodes. It is used, for instance, to locate the interfering eNBs in order to compute the inter-cell interference perceived by a UE in its serving cell.